Last week, after I did my Easter bunny/mice trio bento, Sonoma Bento asked how I colored the eggs. In response to that, I thought I’d post just a quick picture of my eggs taking their little color bath before they became bunnies. Or mice. Whatever. By the way, be sure to visit Sonoma Bento as today is her 1 year blog anniversary! I use my little prep bowls for this, but if you’re doing quail eggs you can probably get away with using silicone muffin cups or maybe even these Silicone Mini Pinch Bowls . These are best because they’re tallish and small, so don’t require a lot of water. 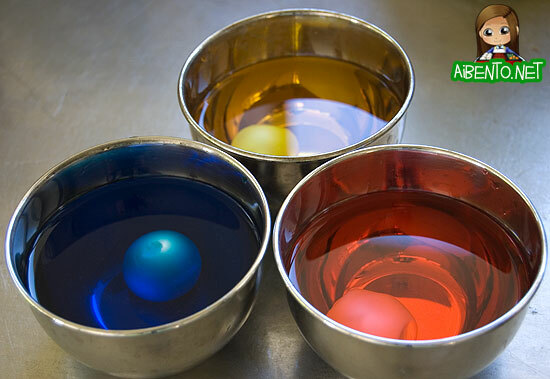 I guess if you are coloring chicken eggs the smart thing to do would be to use those egg dyeing cups from Easter! For small bowls though, you use about a half cup of water and 2-4 drops of food coloring. Start out light and you can get a pink egg using red coloring. For yellow, you could use curry powder and soak it in the fridge overnight. For fast coloring though, food drops are the way to go. After that, just drop the peeled egg in and let it soak. Check it after a few minutes and put it back if you want it darker. 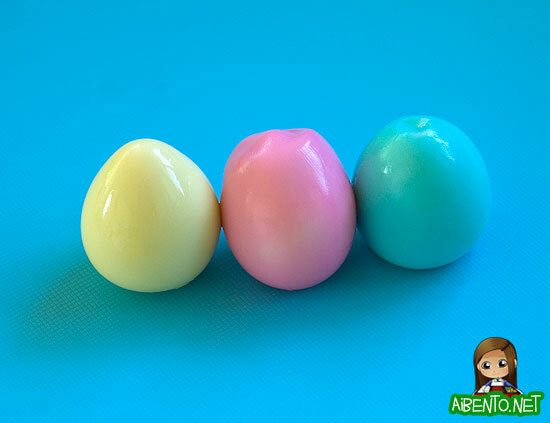 Eventually you end up with brightly colored eggs! I’ve done this for several bentos, many of which you can see in my Easter Bento Ideas post.